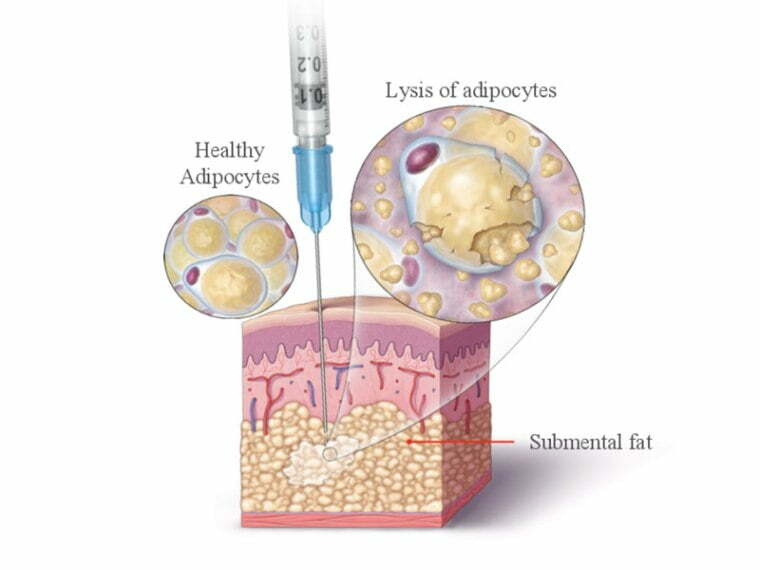 Once fat cells are removed, they don’t grow back. Research shows results will last more than 4 years. 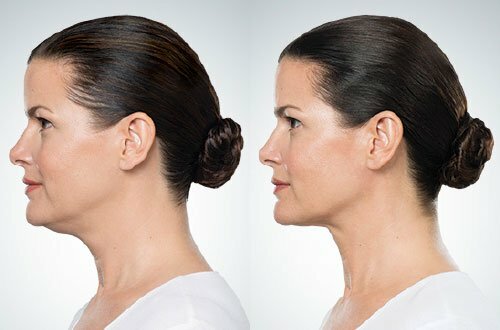 Fullness under the chin, or a double chin, can detract from an otherwise balanced and harmonious facial appearance, creating a heavy or prematurely-aged look. Approved by the Therapeutic Goods Administration (TGA) this treatment consists of multiple small injections placed under the chin, improving the presentation of the lower face and neck by eliminating fat in the sub mental area. The treatment helps to define the jawline and create the contours typically associated with an aesthetically pleasing appearance. Your clinician customises the treatment to suit your individual anatomy, fat deposits and desired outcome. The active ingredient in this injectable is synthesised deoxycholic acid; identical to the molecule naturally produced in the body to aid in the absorption of fat. When injected below the chin, it causes lysis, destroying the fat cell membrane. As a result, the cells breakdown and release their fatty contents. The body naturally metabolises it and the by-product is excreted. The result is a more contoured and defined neck and jawline. Your initial 45 minute treatment includes a thorough medical history, examination and time to ensure you are fully informed about the treatment before proceeding. Subsequent treatments take 15-20 minutes. Our clinic offers topical anaesthetic prior to the area. When you book your consultation, you will be asked to arrive 20 minutes early to have topical anaesthetic applied; this will make the treatment feel comfortable. The treatment itself involves a series of small injections into the area under your chin. Ice packs are applied after the treatment to reduce swelling. If you often experience bruising after injections, our clinics also offer a bruise-reduction cream. 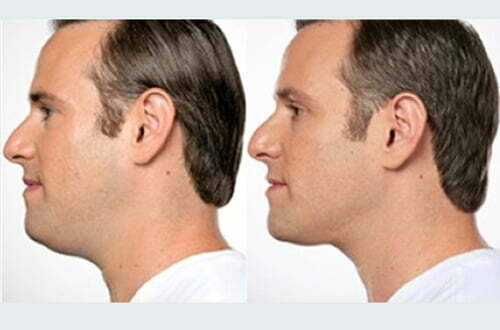 Most patients experience visible improvements in the appearance of their chin profile within 2 - 4 treatments. Up to 6 treatments may be administered, spaced at least 4 weeks apart. Will it tighten the skin under my neck? Yes, clinical results show an improvement in the tone and firmness of the skin under the chin following treatment. While the treatment’s primary objective is to remove fat, it can also have a pleasing tightening effect on the under-chin area. As a prescription-only medicine, this injectable treatment is only available at selected clinics. Under the expert clinical guidance of Dr David Sharp, PRAHS Cosmetic and Rejuvenation Clinics was one of the first practices in Australia, selected to provide this treatment to its patients. Double chin injections are offered at both our Greenslopes practice in Brisbane, and our Ipswich central clinic. Can I use it instead of liposuction? Fat dissolving injections are not a substitute for liposuction or neck lift surgery, where required. It is, however, a non surgical solution for stubborn small fat deposits that a healthy diet and active lifestyle will not budge. The most common side effect is mild to moderate pain or discomfort at the time of injection. While unlikely, contact our clinic if you experience trouble swallowing, an uneven smile, taste disturbances, discolouration, unusual hair loss or ulcers in the treatment area. Like any medical injectable, this treatment carries some risks and that’s why it is important to choose a clinic that offers the medical expertise and support you deserve. 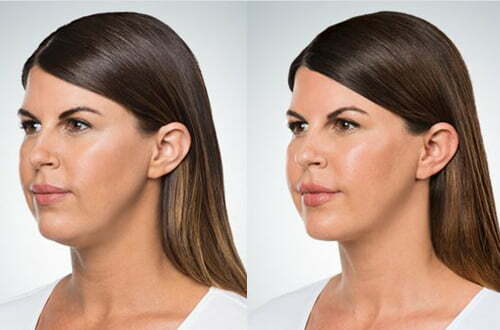 What is the name of this double chin fat dissolving injection treatment? TGA regulations ban the use of the trade name for this product in Australia. A similar version of the product has been available for some time in the United States, where regulations permit the use of it trade name, which has become widely known (so you have probably heard of it before)! However a different trade name is used for the product in Australia, making it somewhat confusing for patients trying to find out more information about its long term use in other countries. If you would like to know more about this product, please call us on 3202 4744 - we are able to discuss the product name with you and provide you with more information. It’s possible to remove small deposits of fat under your chin without surgery. Ask us how fat dissolving injections can make a natural, defined jawline a reality for you. 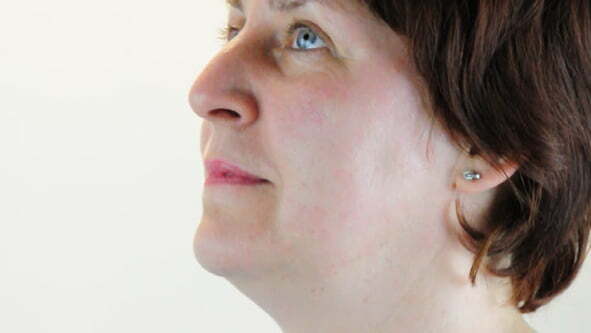 Double chins are one of the most common aspects of people’s appearance that they wish they could change. Almost 60% of people report dissatisfaction with their under-chin area; if you’re one of them, fat dissolving injections may help. If you don’t have time for long treatments or a lengthy downtime, this treatment provides the opportunity to gradually remove fat over a series of treatments without time off work or away from normal activities. We tailor the treatment to suit your individual anatomy and desired results. Once your desired results are achieved, re-treatment isn’t expected as results are maintained for at least 4 years. Often, no amount of dieting or exercise will remove the hard-to-budge fat that accumulates under the chin, causing a ‘full’ or sagging appearance and reducing jawline definition. Not only can this give your overall appearance a heavier look, it can also make you look older than you actually are.